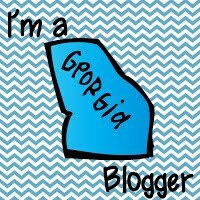 I am linking up with ! 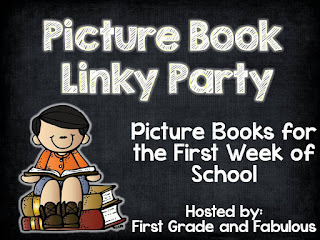 I LOVE to read to my classes, so this party is perfect. I can’t wait to see everyone’s suggestions! I am just going to focus on two books for the first week of school. 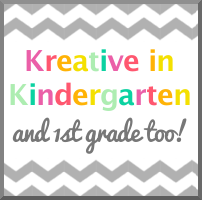 I am using them this year and I have already created some mini- units to use with them! 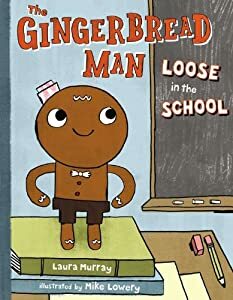 The first book is Gingerbread Man: Loose on the School. I have talked about this book before and I just loved it! I would use it to introduce the students the school building and most importantly principal, nurse, office staff, P.E. teacher, etc. The second book is The Kissing Hand. I love this book! This is a great book to help the students uneasiness of leaving their parents. Click the link for my TPT product to go with this book. Robyn, I love both of your book choices! You can't go wrong with using The Kissing Hand at the beginning of the year. Such a sweet book! Found you through the linky. I'm a new follower! I love your book choices! I have a similar activity...I read the Gingerbread Man to my kids and then we go around the school looking for gingerbread man cutouts I've placed at important places in the school (library, lunchroom, playground, etc). It's a fun way to give a tour of the school. When we get back to the classroom, we have gingerbread snacks waiting for us. By the way, I'm a new follower! I adore the Kissing Hand, such a classic! I've not read the Gingerbread Man Loose in the School- looks like I should be looking into it! Thanks for sharing!